Mantaleda have been manufacturing quality G.R.P. bath tubs for over ten years. They particularly specialise in the production of innovative walk in baths, for the less able. 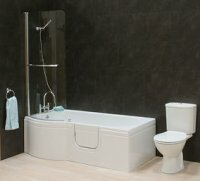 Most of the Mantaleda assisted range including accessories is available at Newport Bathroom Centre so please telephone us on 01633 262629 for our latest brochures, prices and offers. As Mantaleda products are to assist disabled bathers these products and accessories are available without VAT for registered disabled by simply filling out one form. Please contact us direct if you would like to take advantage of this option. The proven outward opening door technology features a generous wide & uncluttered doorway, resulting in unrestricted access. The Ambiance is available as either a straight end (shown) or corner bath. have a physical or mental impairment that has a long-term and severe effect on their ability to carry out everyday activities or have a condition that doctors treat as a chronic sickness (like diabetes, for example) or are terminally ill . 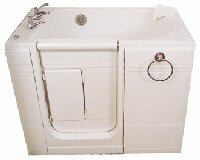 The Athena Bath, a simple solution for easy access independent bathing. 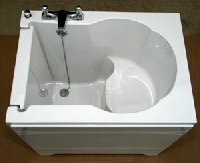 This deep tub allows you to sit and relax in total comfort, to enjoy a good deep soak. Its integral seat is contoured for maximum comfort, and the low entry and wide opening door is simple to operate by a robust, single lever. 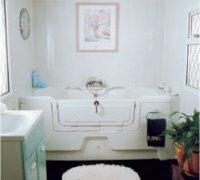 A positive, practical & independent approach to bathing. 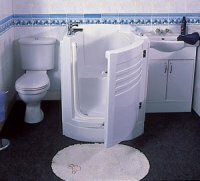 The unique Layezee bath gives the ease of getting in & out at sitting height, and excellent access for wheelchair users. 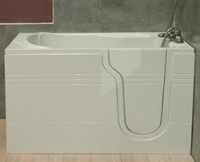 An elegantly designed P shaped bath, robustly constructed with inward opening door. This contemporary bath is a versatile solution for easy access bathing and/or showering. It has a simple latch lock for effortless door operation. Just slam to shut and lift knob to open. Also available is a toughened glass shower screen with bright silver pillar and handle, along with hydrotherapy spa options.